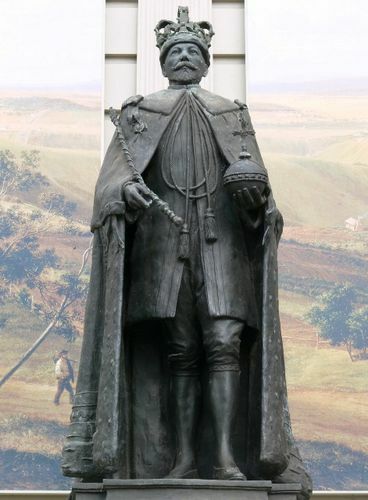 The statue commemorates King George V. It was erected in 1938 as Geelong's memorial to the late King. George V (3 June 1865 – 20 January 1936) was King of the United Kingdom and the British Dominions, and Emperor of India, from 6 May 1910 through the First World War (1914–1918) until his death in 1936. After a year's work, Mr. Wallace Anderson, the Melbourne sculptor, has completed the plaster cast of Geelong's memorial to King George V. The cast, which is more than 8ft. high, will be shipped to England this month so that the statue can be cast in bronze. Mr. Anderson had hoped to have the statue made in Melbourne, but the bronze-founders are not able to cope with work on this scale. It will be at least six months before the completed statue is erected. Argus (Melbourne), 2 July 1937. Arrangements were made at a meeting of the King George V memorial committee today for the unveiling of the memorial statue in Johnstone Park on October 26 by Lord Huntingfield. The ceremony will take place at 11 a.m. Lord Huntingfield will then proceed to the city hall, where he will be entertained by the mayor of Geelong (Alderman C. N. Brown). In the afternoon he will witness the children's display at the Corio oval, and at night will attend the official Centenary ball. The Age (Melbourne), 9 August 1938.